The AGPL (Affero General Public License) has continued to gain in popularity and is showing up frequently in modern codebases. My blog post Are SaaS Companies Immune to Open Source Risk? mentioned a key concern for SaaS or cloud companies, a class of open source licenses that includes the Affero GPL designed to plug the SaaS loophole. (As I describe in the blog, this is by no means the only concern for SaaS companies.) Heather Meeker wrote good one last year that looks at the AGPL from all angles and muses about its adoption. 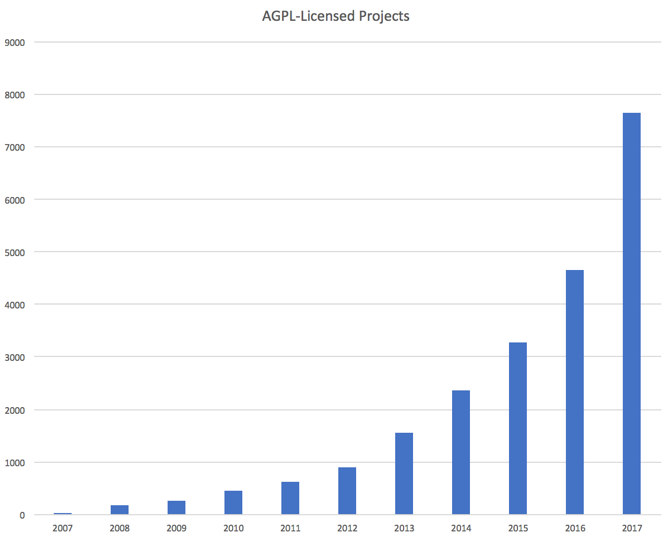 Recently, an open source attorney friend asked Synopsys to refresh research we’d done several years ago on AGPL numbers, and it was striking to see how much such licenses have gained in popularity. What’s the legal loophole with AGPL? The aforementioned legal “loophole” refers to the fact that the obligations of the GPL, the very popular license of most concern to most companies, are triggered only on distribution, and therefore do not affect hosted software. The Affero GPL was conceived of by Richard Stallman and Henry Poole, the founder of a web services business called Affero. The preamble describes that the license was “specifically designed to ensure cooperation with the community in the case of network server software.” Their aim was specifically to put the GPL’s obligations on companies offering their software as a service, i.e., not distributing. A number of other licenses share this attribute, including the Open Software License, the Common Public Attribution License, the Sleepycat License, the Academic Free License, and the Honest Public License. You can find them all in the SPDX license list. But the AGPL is by far the most popular license, covering over 80% of projects governed by this style of license. When we first dug into the expansion of use of the Affero GPL, it had been adopted by about 1,000 projects. It was small number even at the time, but associated with some very popular projects. Refreshing the data recently, we found that the use of Affero GPL has ramped by almost an order of magnitude — to about 8,000 projects. With cloud and SaaS being so popular today, if someone wants to keep their software “free” (as in “freedom”) or if a company wants to cover all cases with a dual-licensing strategy, it makes sense that they would pick the AGPL. And, while 8,000 projects is not huge in the context of the millions of open source projects out there, the frequency with which they show up in audits suggests they are overall very popular. The AGPL is alive and well.